Once upon a time, a very strong rakshasa called Andhaka performed a hard penance to please Lord Shiva. Bholenath (Lord Shiva) was pleased, and offered him a boon of his choice. Andhkarsura asked for a boon that everytime a drop of his blood fell on the earth, he wanted a new Andhkarsura created. Lord Shiva granted him the boon. Armed by this powerful boon, Andhkasura started a rein of terror. Nobody could defeat him, as every successful attack that wounded him caused his blood to drop onto the ground. Everytime his blood touched the ground, it ended up creating an army of Andhakasuras. This army of Andhakasuras were very difficult to defeat. They spread destruction everywhere around, fought with kings and devas alike, and were impossible to defeat. Everyone went to Mahakaleshwar (Lord Shiva, the protector), and asked him to protect them. Lord Shiva battled with Andhakasura, but every time Andhaka’s blood touched the ground, a new Andhakasura was created. After fighting for a long time, Lord Shiva got tired. Drops of his sweat fell on earth. At the place where they fell, the earth opened up. From the womb of earth, Lord Mangal came out. Mangaldev started absorbing every drop of blood of Andhkasura that fell out. Thus, Lord Mangal assisted Lord Shiva in the battle, and prevented Andhakasura from being reborn by using his special boon. 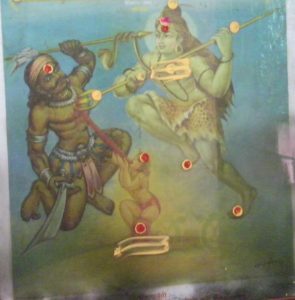 Assisted by an able Mangaldev, Mahakaaleshwar won the battle easily against Andhkasura and killed him. It is believed that Mangal planet was born at the site of the ancient temple of Mangaldev Ujjain, the land of Mahakaal. Since Mangaldev was thus the child of Lord Shiv and Prithvi (Bhumi – Planet Earth), Mangaldev is also called Bhaum. The place around the battlefield is believed to have red mud. Mangaldev’s complexion is also believed to have turned red because of the blood, similar in colour to the planet Mars. In Vedic astrology, Mars is known as Mangal (Auspicious), Angaraka (Burning Coal) and Kuja (The fair one).